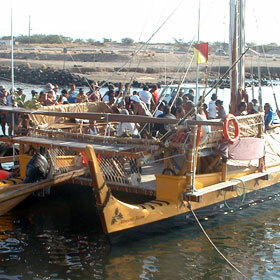 THE VOYAGE BEGINS » Well-wishers lined the Kawaihae Harbor dock on the Big Island yesterday as the Alingano Maisu prepared to depart with the Hokule'a on a 4,400-mile voyage across the Pacific. New foundations are being installed after rain eroded the hillside in March. The company plans a July 1 start despite lingering opposition. The canoe finally sets sail after days of delays. A retired Hawaii Kai couple uses deposits to help villagers. An exercise class that uses taiko drumming elements benefits the mind and the body. No. 5 Hawaii outlasts Pacific to sweep the series with the Tigers. The Warriors will close their regular season with Washington. He fires a 9-under 63 to lead by two strokes after the first round. The grant will fund retraining for the 180 laid-off employees. State law enforcement agencies have called for a requirement that scrap dealers record the source of copper that might have been stolen.